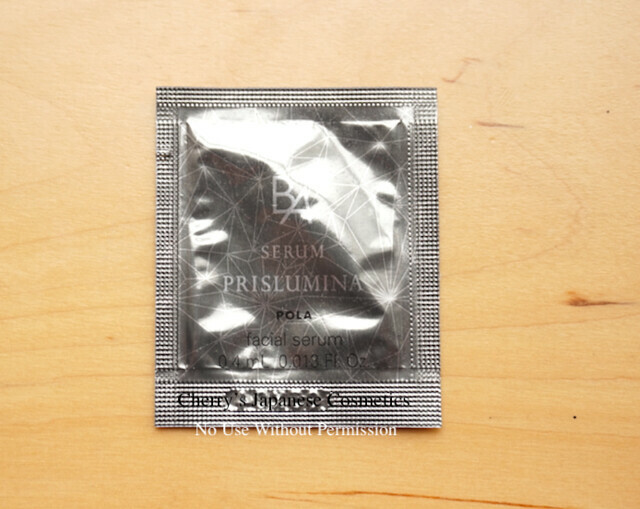 I got samples of Pola BA Prislumina, what has good reputation as a serum making your skin naturally glow. Pola claims Prislumina makes your skin inner glow. It is for dull skin or tired skin. Yes, due to the seasonal issue, Spring Fever, I am feeling tired and my skin is coming to being dullness. So sad. Touching my face I feel still my skin is supple, but I never want anyone to touch my face. Supple but looks dullness and uneven skin tone. In person, Pola ba or red ba is a brand, what is fixing to my skin. My skin is sensitive, but I can use most of Pola products. And as the season, my skin condition is fine. Not perfect but fine. So I opened the package. Pola skin care method is a classical; wash, lotion, emulsion or cream. This prims is an essence using between lotion and emulsion/ cream. The scent is floral, it is not by essential oil, but artificial. I thought if there were no perfume. Yes, it is faint but kept smelling so long. On my face it is really smooth and well moisturized. Indeed glow? Hmm. I had used only a couple of samples. I can not say that point. The texture is light and less oily than I had thought. In summer I may end with this essence without using creams nor emulsions. In person, I felt it is not bad but not buying a full bottle. It is no harmful for me, but not beating other products what I am using now. And also checking what other reviewers are saying, mostly they are loving it is helping their dull skin looks fresh, but I also found that it is harmful for some sensitive skin. It fixed to me, but it does not meaning it fixes all of you. If you are a person who are thing your skin is sensitive, it may not for you. Generally to say, it is not pretty bad but there are no reason to switch from my current routine. We are wondering wether we deal Prislumina as regularly or not. If you want to have this essence, please feel free to ask us. Please do not forget the city we need to ship to.